If you are ready to do landscaping and outdoor decorating on your new home then one of the things you will need to think about is outdoor lighting. 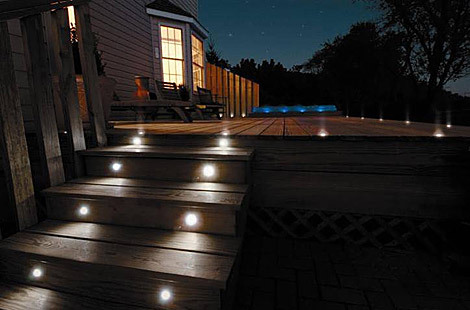 There are many different kinds of outdoor lighting to choose from and the lights you decide to install will depend on how large your yard is, how much landscaping or gardening you have, whether or not you have a sidewalk, your proximity to street lighting, whether or not you have an outdoor patio or deck, and whether or not you have stairs or a porch. There is not right amount of outdoor lighting. You just have to weigh the costs of lighting the outdoors with your aesthetic desires. If you have a green thumb and your yard is perfectly landscaped, then you might consider outdoor garden lighting. This type of outdoor lighting is meant to accent the beauty of your garden or certain areas of landscaping at night. The lights will generally be soft and pointed up at the bushes, flowers, or trees – not down. Most of the time, the garden lights will be disguised as something else so that they are not noticed during the day. A rock or small statue could be ornamental during the day and your light fixture at night. Other outdoor accent lights are recessed into the ground so that they are not visible at all except for the light that they shed. Another variety of outdoor lighting is security lighting. Especially if your home is far away from a street and cannot take advantage of street lighting, you need to have some kind of flood lighting for security purposes. Most homeowners choose security lighting that is motion sensitive so that it turns on when someone approaches your home. That way, there is not harsh light shining all the time, but you have enough light to scare off a possible intruder when you need it. In addition, the security lighting will provide you with the security of light when traveling to and from your car after dark. Still another important form of outdoor lighting is outdoor patio lighting. If you are lucky enough to have an area outside for social gatherings like a patio or deck, then you want to be able to utilize it at night. Therefore you need to light that area as if it were a room inside your house. Of course, the lighting can be much softer than indoor lighting, but you still want to be able to read so that you could entertain on the patio. All of this outdoor lighting could begin to get expensive if you were running it every night. It seems like a waste to be using electricity and tying up part of the grid for lighting an area where there are no people doing any kind of activity. A good solution for this problem is solar lighting. Outdoor solar lighting converts sunlight to energy which is stored in a battery which in turn powers an LED. LED lighting is softer than normal light bulbs and is perfect for most outdoor applications.